Adult acne. Often depressing and always frustrating. Many of our clients with adult acne had normal skin during puberty and are suddenly hit with this self confidence crippling skin condition in their 30’s or even 40’s. For others, acne dominated their teenage years – often accompanied by crippling period pain – finally clearing only to return later in life at a time when they believed they were safe from pimples and painful cysts. To make it even more frustrating, what worked for their teen acne does nothing for adult acne and in many cases makes the condition even worse. In this post we’ll be focusing on the hormonal aspect and will cover the others in future posts. Is your acne caused by hormones? If your acne gets worse before your period or started during pregnancy, menopause or when starting or stopping the contraceptive pill, then it’s probably driven by hormones. Adult acne that is due to hormonal imbalance is often cystic and can affect the back, chest and face but is often worse around the jaw, chin and neck. Depending on the health of your skin and the products you use, recurring hormonal cysts and can cause pigmentation and scarring. It’s important to understand that stopping future cysts and breakouts won’t clear this scarring and darkened pigmented skin. This needs to be addressed separately with appropriate skin care products. For pigmentation – the Bright Skin range from Eminence has natural as well as trademarked skin lighteners in each of their products to help reduce pigmentation. Citrus and Kale serum is also very effective over time at reducing pigment as well as calming acne and evening out the skin colour and tone, along with the Bright Skin and Citrus and Kale masques which are both a great adjunct to weekly home care. Scarring is an ongoing matter – however with good skincare and ingredients designed to calm redness over time being applied every day to your skin, you have a much better result long term in not only hydrating and not aggravating your skin, but also in using the right skincare you can ensure no further damage to your skin. We can recommend the best products for you when you come in. Like the term ‘toxicity’, ‘hormonal imbalance’ is thrown about a lot in regards to adult acne, but what does ‘hormonal imbalance’ or ‘fluctuating hormones’ actually mean and why does it give you acne? An increase in male androgen hormones such as testosterone and DHEAS are the most common forms of hormonal imbalance that lead to acne. Androgens make your cells large and go into hyperactive overdrive producing way too much sebum or oil. The theory is then that bacteria munch on this excess sebum, causing inflammation and blocked pores, resulting in a cyst or pimple. In reality it’s multifactorial and in part 2 of Adult Acne we’ll cover how years and years of harsh chemicals or the wrong skin care can leave your skin slow to heal, damaged and chronically inflamed. This creates the perfect environment for acne causing bacteria to flourish – add in stress and some hormonal imbalance for the perfect adult acne recipe. Stress (this also includes environmental and lifestyle stressors like not enough sleep, shift work, the wrong type of light, toxicity, poor bacteria in your gut, poor liver function, nutritional deficiency and too much sugar or stimulants like caffeine). Too many carbohydrates and sugar. PCOS (poly cystic ovarian SYNDROME) is the most common diagnosis or name given to the hormonal imbalance that can result in adult acne. Another type of hormonal imbalance that can result in adult acne that’s worth mentioning is an underactive thyroid. Your naturopath or your doctor can organise to have your thyroid investigated, especially if you have other signs and symptoms of an underactive thyroid. What causes the hormonal imbalance? First up, hormonal imbalance is NOT caused by a deficiency of the contraceptive pill. ‘The Pill’ does not balance your hormones in any way, it simply stops your own hormonal dance and saves problems up for later. The imbalance will still be there when you stop taking ‘the pill’. 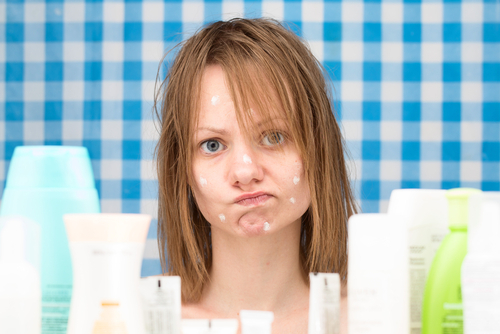 We often talk about ‘toxicity’ as a contributing factor in adult acne. But what does toxicity mean? Stop and think about your cells for a minute. Every single cell in your body is bathed in fluid, this fluid is lymph. Lymph takes nutrients out of your blood and allows them to diffuse through the fluid to be absorbed into your cells. Your cells are tiny living organisms that work co-operatively together (think of a bee hive or an ant colony). Like any living organism, they produce waste products and their cell poop is released into this fluid that surrounds them. This cellular poop (also known as metabolic waste) is collected by your lymphatic system, carried around and finally dumped in your liver for processing. Now imagine your liver as a great big chemical processing plant. It filters chemicals, toxins, fats, proteins, carbohydrates and nutrients coming into the body from your gut as well as cellular poop, chemicals (that have entered through your lungs or skin), left over hormones and bits of bacterial and viral fragments being dumped from your lymphatic system. Next, start visualising that you’ve got some nasty bacteria hiding away in your gut producing heaps and heaps of toxic bacterial poop. Your liver is being smashed as it continually has to deal with these bacterial toxins being thrown at it by unhealthy microbes living in your gut. It’s tired and it’s only got so many resources (enzymes) at its disposal so it tells your lymphatic system to wait while it deals with the toxins coming in from your gut. That’s fine if the microbial chemical assault only last a few days but if this goes on for weeks, months or years you’re going to get a backlog in your lymphatic system. It’s going to get pretty toxic. On top of this, your liver isn’t processing and clearing out hormones properly so you develop an imbalance. If stress is part of your acne’s trigger it will weaken the integrity and strength of your skin, allowing bacteria to flourish who take advantage of this imbalance and toxicity. In case you missed it, your gut is also VERY important when it comes to healthy skin and adult acne. We’ve covered how gut health and toxic bugs in your gut can lead to problems like adult acne in Love Your Guts part 2. The most beneficial thing you can do for your adult acne is a good gut detox and look after your liver with regular detoxes and liver cleaning herbs. This not only helps with addressing underlying hormonal imbalance, it also helps to clear out a major source of toxins for many people – that is toxins being produced by bad bacteria in your gut. Getting rid of sugar, stimulants and addressing YOUR source of stress are also essential. Stress can contribute to hormonal imbalance, in fact it can be one of the main triggers for many women. Stress affects the fragile dance of communication that occurs between your ovaries, adrenal glands and brain. And it doesn’t even have to be bad or negative stress to do this – it’s common for women to experience missed periods when travelling due to changing time zones and schedules. In fact stress doesn’t even have to be emotional. Environmental stressors are diverse, but all result in the very same increase in levels of your stress hormones, which can then lead to an increase androgens. Poor light quality – not enough sunlight and too much bright, blue light at night time (often from phones, laptops and other screens). Too much sugar and too much caffeine. One of the most frustrating things about treating adult acne is that it does take time, often around three months to begin to see improvement. You need to address all of your triggers or the underlying causes, it’s rarely just one. For example you may have a genetic predisposition to developing adult acne but the stress of a new job or moving country, combined with using harsh skin care and too much partying stressing your poor liver, is what actually triggers your acne. For someone with a different genetic predisposition, these same factors may trigger auto immune disease or even chronic fatigue. Your genetic predisposition is simply your weak link. On the positive side, an added benefit of committing to treat the root cause of your skin problem, is that your overall health and sense of wellbeing will also grow in leaps and bounds and stabilise over time. Try and tick as many of these boxes as you can. 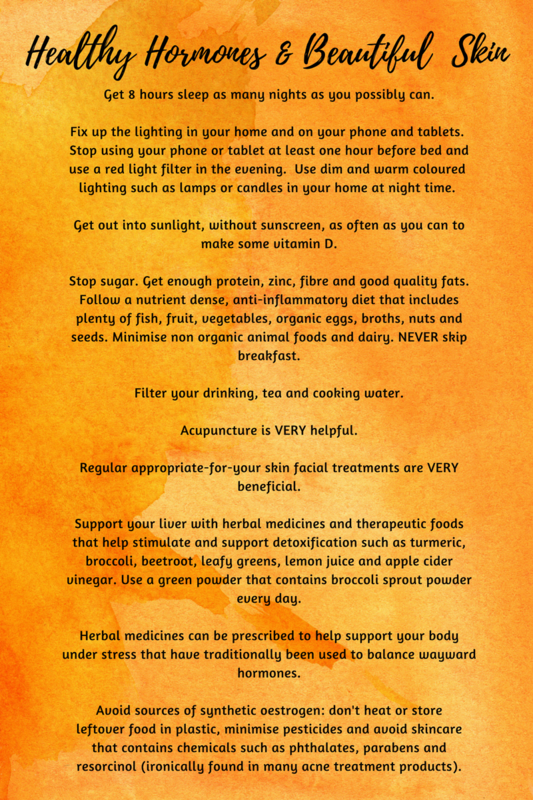 A gut detox is an essential part of healing your skin and should be done regularly. At least every 6 months, ideally every 3 months in the beginning. If you’re ready to work on getting your hormones healthy the natural way you can book an appointment with either Junia Kerr or Sarah Luck. Book in with our holistic beauty therapists Junia Kerr, Niamh Gill, Evonne Campo-Romero or Wind De Moet about appropriate skincare to address scarring and pigmentation. Martine Ryan also offers Purifying High Frequency treatments for acneic skin. We will also help guide you on using gentle skin products that are appropriate for YOUR skin and don’t strip, dry, inflame or damage your skin further. You can also book acupuncture appointments with us too. Yvette is skilled and experienced in working with imbalances. Health fund rebates are available for some of these services. Can’t get to our wholistic beauty clinic in North Bondi? Naturopath appointments are available via Skype or FaceTime. We can also advise you over the phone or via email on suitable products to help your skin. Phone us on 02 9130 7064 or send us an email.